The red wood and roof ornaments stood out brilliantly against the trees in the background. The low f/stop on the lens did a great job here. Colored wooden structures in Japan always seem to have a certain charm. They look so totally in harmony the surroundings, and yet only meters away are new modern concrete buildings. Pathways and the lights that come on at night are a nice defining line to this garden landscape. Nice contrast of green and red with some slight mix of gold in the roof beams. Looking through the entrance way to the gardens. A nice mixture of greenery , rocks and water. I could imagine this setting in Kyoto. It is hard to imagine that this garden is in the middle of a hotel complex and only minutes away from a major Tokyo Station. The roof is very grand. A lot of work has gone into this. The tea house area for reserved guests. Some of the garden pieces were mixed in with the greenery. The main hotel building can be seen in the background here. It looked quite strange to see such a large building looming over the garden from this angle. Like coming out of a forest clearing and seeing the big city. You can see the modern glass building of the hotel apartments in the background of this building. It doesn't actually spoil the look or atmosphere of the traditional garden. Some of the garden ornaments were leaning to one side. I had to check my balance a few times when taking this photo to see whether I had the camera straight. Great detail here on this piece. Is that a dragon? Trying out a bit of depth focus on this bridge. A little bit hard to stare at this photo for too long. Your eyes start to struggle to find a focus point across the bridge. Like walking the tightrope over a canyon. Arches through to the main structure. One of the garden objects. Nice little stream with a mixture of greenery. It is nice to see some small bridges in Japanese traditional gardens spanning the water. Some are curved, maybe painted red, others like this one are more plain, but equally pleasing to the eye. From the traditional garden across to the hotel there is a nice transition area where they have some lawn grass. The bridge crossing over to the main garden. Looking back at the main Grand Prince Hotel Takanawa. There was a nice steak house restaurant in the grounds of the hotel. This would be a good place for a meal at night. A lion sitting in protection of the hotel grounds. There are a number of Takanawa Hotels in the complex. It is quite easy to get lost looking for the right path to take. The garden sits in between the middle of them all. The winding round leading up to the top of the Hotel complex. Do you enjoy looking at traditional Japanese gardens? Very nice pics! The hotel seems interesting: it looks nice with the big windows on the ground floor, but grey and dull on the upper floors. Loved the pic of the curved road and the gardens. I think this hotel is quite old, but they recently renovated the lower coffee shop and lobby area. yes, a nice japanese Dragon. how do I know is japanese? only 3 claws.. chinese one have 4 or 5 for the imperial dragon.. korean dragon heve 4.. some times 3, if influence by Japan..
By seeing pics of these , it makes me feel more relaxed and peaceful . I personally would like to go there and feel the harmony , nature and peacefulness of the Garden with its Ornaments and buildings . Sometimes , You just have to appreciate nature’s beauty . I really Love those Traditional Japanese houses . Missing something? Looks like a some kind of hook. Thanks for tip on what type of dragon this is. This reminds me of the song by Simon and Garfunkle: The Long and Winding Road. Thanks for the stroll. It was a very peaceful way to start the day. I love the contrast between the simple and the ornate and contrived; everything goes so harmoniously together. The garden appears to hold its own against the surrounding buildings. This is a beautiful garden. I remember the Hotel New Otani has one very similar to this. A real contrast to the often boring building which is the hotel itself. 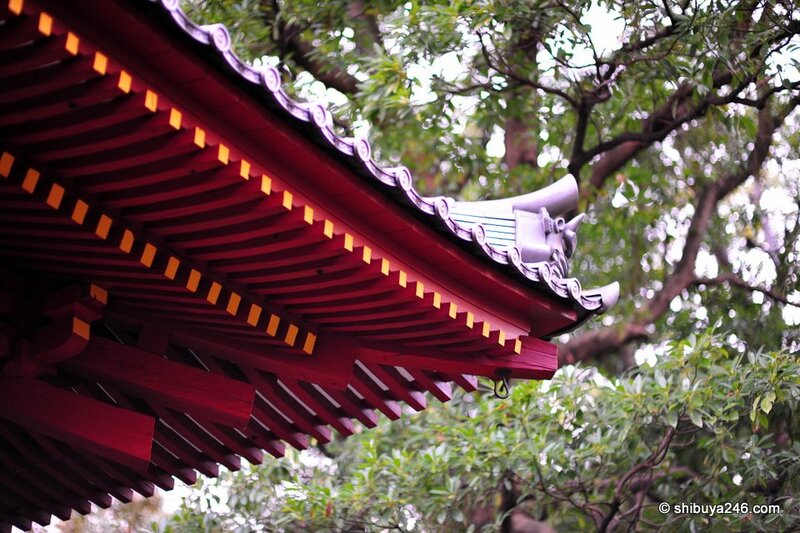 Gorgeous photos of the Japanese garden. It seems like a tranquil spot to meditate, did the noise of the city disrupt your picture taking? Stunning, stunning photos….love the colour and composition! Beautiful photos. I’d love to go there just for the sake of seeing it.! Excellent pictures; as you say so tranquill considering how close it is to the hustle and bustle of city life. Are the gardens free to roam around or do you need to be a paying guest? Open to public, but I doubt non-guests would have known about the garden. I stayed at one of the hotels in this complex, the Prince Sakura Tower. The garden was really nice and calm. It felt separated from the rest of the city. Hard to imagine that the train station was only like 5 mins away, yet it was peaceful here. Btw, love your site and photos. Got to see a lot of stuff you saw. Got hundreds of photos of the surrounding sites. Hope to find more cool places during my long-term stay in Japan.